I got back into ham radio in 2008. My first new rig was the Icom 703 which made me a QRPer and opened the door to portable operating. 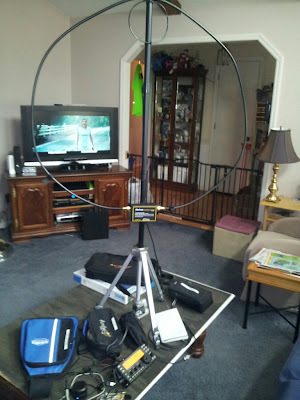 Reviewing my photos and blog I can reconstruct a history of antennas I have used for portable operating. I was doing travel for work in 2008/2009 and my focus was operating hotel portable. I guess my first highly portable antenna was the Buddistick. The second was the Parr End fed half wave. These factored into a number of hotel setups. Most notable was a trip to Italy and operating as I/N4KGL in Vicenza Italy. The game in hotel ops is seeing what you can get away with as far as stringing the end fed to near by trees or sticking the Buddistick out the window. Eventually I got a visit from hotel management but they gave me a pass. In 2010, I got into what I call parking lot portable. So my gear did not have to be so lightweight. I got a set of fiberglass military mast four foot sections. I have a hitch mount that let me stack 5 or 6 together. I have made a lot of use of the military mast including field day ops but still a bit heavy. I tried many antennas supported by the military mast including ham stick rotatable dipoles for 40 through 10. I would say the hamstick dipole not so great on 40 but does fine 20 meters and up. The Buddistick can be elevated to advantage. I experimented with shortened multiband doublets fed with 300 ohm line. One incarnation was a portable inverted U. It was a little unwieldy and I found it did a good job of catching descending rockets at our launch site. You can add 20/ 40 meter ground planes to my list of antennas supported by military masts. I got some tripod adapters for the military masts and that let me have stand alone masts. Hamstick dipole and military mast from hitch mount. In 2011, I finally got into fiberglass crappie fishing poles of up to 20 feet. 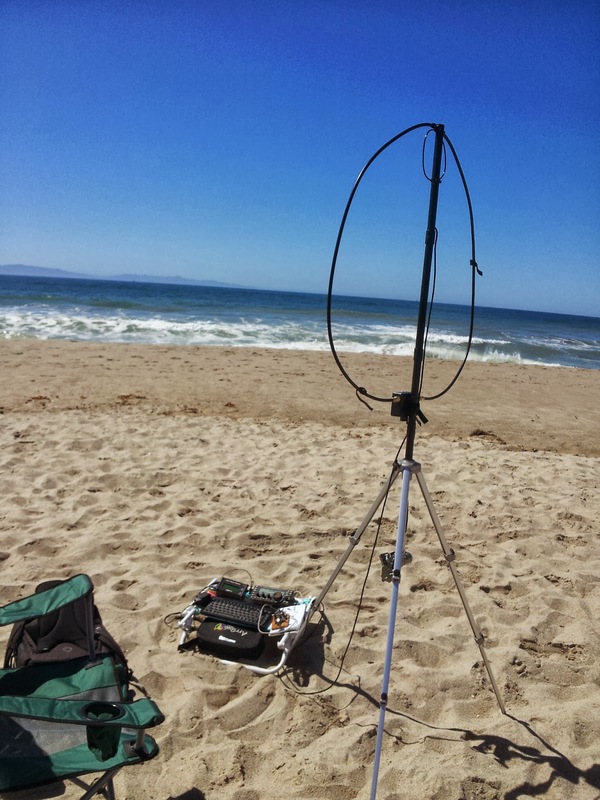 This opened up possibilities for lightweight portable antennas. I built a SOTA tuner with lets you use thin half wave wires. This works well with the crappie poles. In 2012, I took a leap to the Alexloop magnetic loop. It is a bit expensive. To look at it you would say that can't work so well. However, the only thing that limits you with the Alexloop is your mental attitude. My attitude changed as the performance is great and the convenience is wonderful. I even have good luck on 40 meters where I have found it does especially good for NVIS. My support for the Alexloop is a camera tripod. I can operate at the beach, parks, parking lots and hotel rooms. In August 2012 I received the KX3. I like to say say the KX3 and Alexloop is critical mass for portable ops. Alexloop on table top indoors. In 2013, I ordered some 28 gauge ribbon cable. A 100 ft ten conductor roll can spawn many antennas. I built two of the NorCal Doublets one 44 foot long and one 88 foot long. I like the way the ribbon cable folds and I have made long wires and dipoles with two strands of ribbon cable shorted together. Also in 2013, I got the LNR Trail Friendly 40/20/10 End Fed. This antenna is so compact when wound up that it makes it perfect for my backpack or even my pocket. Actually there are too many antenna experiments to mention them all. Antennas are lots of fun and I am endeavoring to understand the theory as well. So my Go-To portable antennas at this point are the Alexloop and the Trail Friendly End Fed. I can use the end fed with my 20 ft crappie pole or the 31 ft Jackite pole. Bear in mind I have lots of reserve antennas I drag out occasionally. The Buddistick came in handy for hotel ops in California recently. There was a forum thread recently on the best portable antenna. I have to say the best antenna is the one that fits your portable operating situation or backpack. Of all the antennas I have used, none have failed to yield some contacts. I think propagation conditions and the operators wanting to work you are bigger factors. Of course, you can help yourself by various tricks and strategies to make QSOs. I find that if CW is dry switching to SSB can be the ticket. As for portable antennas, a journey it is and I find it never ending. My wife will tell you, those darn antennas are all over the house.